Rosemary oil is known for its numerous therapeutic properties and health benefits, as well as for its pleasant fresh herbal aroma. The oil is extracted from the leaves of Rosemary (Rosmarinus Officinalis), a herb from the mint family Lamiaceae. It is a close relative of sage, lavender, Lemon Balm, peppermint and basil. Dry and fresh leaves of Rosemary are used as a culinary spice, especially in the Mediterranean cuisine, and they perfectly complement a great variety of foods (including various types of meat and vegetables). Rosemary plant has very beautiful light blue flowers which can be observed in their full bloom every spring. Probably, this beautiful blue color of the flowers gave an idea to Ancient Romans to name the plant “Sea Dew” (the Latin Rosemarinus). The plant originates from Asia, but in our times it is cultivated in Yugoslavia, France and Tunisia. A great deal of modern medicines, medicinal preparations, hair care, skin care and beauty products contain rosemary essential oil. This natural oil is rich in such chemical components as camphor, bornyl acetate, cineol, linalol, thujone, pinene, verbenon, alpha-terpineol, borneol, beta-caryophyllene, a number of antioxidants (rosemarinic acid, caffeic acid, carnosic acid, etc.) and other useful compounds. Rosemary containing products are considered great sources of calcium, iron and Vitamin B6. The plant is used in modern medicine for its stimulant, antidepressant, nervine, hypertensive, tonic, diuretic, carminative, cholagogue, analgesic and other therapeutic properties. Rosemary plant is known as a “brain herb” since it is an effective stimulant for mental activity and can be effectively used by the students during their exams to increase the abilities to focus and study more efficiently. Rosemary oil can be used to treat nervous breakdown, depression, memory loss, mental fatigue, etc. Besides, rosemary baths are recommended for those, who suffer from arthritis, rheumatism, headaches, muscle pains and other related problems. 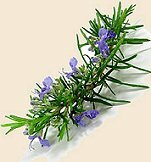 Also, rosemary has positive effects on the hair follicles and scalp, so it can stimulate hair re-growth. Regular rubbing 2-3 drops of this oil into your scalp can refresh and moisturize the skin. A mixture of rosemary, basil and tea tree oils can assist in combating dandruff problem. Moreover, this medicinal plant can be used to treat eczema, acne and dermatitis. 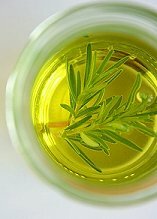 Disinfectant properties of rosemary oil are used as a part of small cut treatment and mouth care program. The oil has positive effects on respiratory system and can be used to treat such problems as asthma, bronchitis, whopping cough and so on. Rosemary products can help to get rid of intestinal infections, dyspepsia, eating colitis, stomach cramps, flatulence and other related ailments. In addition, rosemary can help to lower menstruation pains, improve blood circulation, strengthen the vessels and even stimulate weight loss. In aromatherapy, rosemary essential oil can be combined with lavender, eucalyptus, mint, bergamot, lemon and other oils. Everyone who is considering using rosemary essential oil should remember that this oil is a very powerful stimulant and neurotoxin. That is why those people who suffer from epilepsy, high fever and other health problems, should avoid it. Besides, the oil can cause allergic reactions. an overdose can lead to such unwanted side effects as muscle spasms, nervous twitches or vomiting. Rosemary essential oil should never be consumed internally. According to the experts, pregnant and breastfeeding women should avoid using rosemary essential oil since it can have negative effects on fetus and even cause miscarriage. Please, consult your health care practitioner before using herbal products containing Rosemary. This entry was posted 9 years, 11 months ago. Good day, please can you tell me where I can find Rosemary Essential Oil as I believe it’s good for the hair. I live in Cape Town and tried Clicks Stores, Diskom, etc, but believe they don’t stock these.